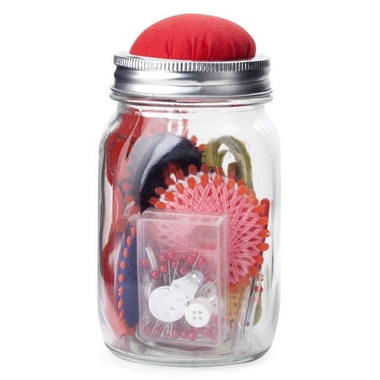 This crafty mason jar makes a stylish sewing buddy! Unscrew the pin cushion lid to reveal an entire sewing kit. Comes with a variety of thread wheels, a thimble, stitch ripper, needle set, scissors, pins and buttons, needle threader, and a tape ruler. Cool concept but very cheaply made. The pin cushion is crooked, the thin thread is wrapped around cheap plastic spoils. The scissors are pretty useless. A great concept if youâ€™re in a pinch or rarely sew (like me) but I donâ€™t expect it to last. Great basic sewing kit. Bought this for our daughter who is going away for university. Has all the essential needs and is compact to store.